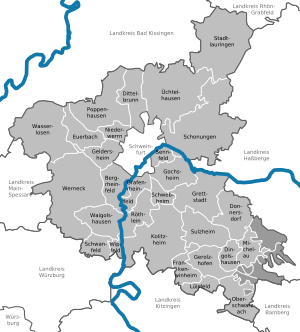 Schweinfurt is a Landkreis (district) in the northwestern part of Bavaria, Germany. Neighboring districts are (from the north clockwise) Bad Kissingen, Rhön-Grabfeld, Haßberge, Bamberg, Kitzingen, Würzburg and Main-Spessart. The district-free city Schweinfurt is surrounded by the district. Primary rivers in the district are the Main and the Wern. The district is located between several hill chains - Haßberge to the east, the Rhön in the northwest, the Spessart to the west and the Steigerwald in the southeast. The area of the district became part of Bavaria in 1814. In 1972 parts of the previous district Gerolzhofen (including the town Gerolzhofen) were merged with the district. The coat of arms shows the imperial eagle in the top part as a symbol of the former imperial city Schweinfurt. The bottom part of the coat of arms shows the symbol of the Prince-Bishopric of Würzburg, which ruled a big part of the district until 1803. Wikimedia Commons has media related to Landkreis Schweinfurt. This page was last edited on 1 February 2018, at 13:13 (UTC).